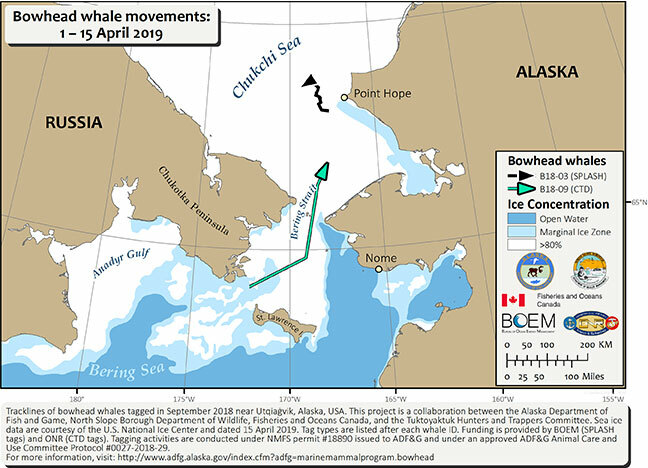 From 1 to 15 April, we received locations from 2 tags deployed on bowhead whales. Bowhead B18-03 (black) was in the southern Chukchi Sea, generally near Point Hope, Alaska. Bowhead B18-09 (teal) moved north through Bering Strait into in the southern Chukchi Sea. The Bureau of Ocean and Energy Management (Carol Fairfield) and the Office of Naval Research (Michael Wiese) funded this effort. Tagging activities are conducted under NMFS permit #18890 issued to ADF&G and under an approved ADF&G Animal Care and Use Committee Protocol #0027-2018-29. Sea ice data are courtesy of the U.S. National Ice Center, dated 15 April 2019 (http://www.natice.noaa.gov/products/daily_products.html). 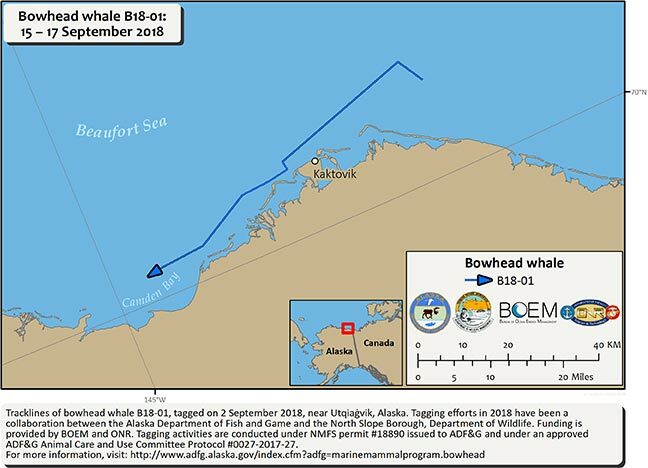 On 2 September, Billy Adams, Jordan Kippi, Quayaan Leavitt, and John Citta tagged a 45-50' bowhead whale near Utqiagvik (formerly Barrow), Alaska. This tag did not transmit at first and we feared the tag was placed too low on the whale. On 15 September, the Argos satellite system finally got a lock on the tag's position and the tag is currently transmitting normally. Interestingly, the tagged whale moved east after tagging. Since the tag came back on the air, the whale has moved west, past Kaktovik, and is now in Camden Bay. We commonly see tagged whales make such loops in July and August, but this is the first loop we have observed in September. East winds cause upwelling along the shelf break and deliver whale food onto the shelf. Most of the winds over the last month have been west winds, which do not promote good feeding conditions, and the tagged whale may have circled east looking for food. We now have east winds and whales are being sighted near-shore at Utqiagvik. We hope to deploy more tags on bowheads when the winds calm. This year's tagging effort is a collaboration between the Alaska Department of Fish and Game, Arctic Marine Mammal Program and the North Slope Borough, Department of Wildlife. Funding is currently provided by the Bureau of Ocean and Energy Management and Office of Naval Research. Tagging activities are conducted under NMFS permit #18890 issued to ADF&G and under an approved ADF&G Animal Care and Use Committee Protocol #0027-2017-27. Animated bowhead movements between May of 2006 and July of 2010. The animation is large and may load slowly (3.3 MB). Bowhead whales are the most important subsistence species for coastal and island communities in the Bering, Chukchi and Beaufort seas. We work with subsistence whalers to attach satellite transmitters to bowheads to study their movements, habitat use, and behavior throughout their range including migration routes and timing, feeding areas, diving behavior, time spent within the spring and summer ranges. We also study how bowhead whales interact with oil and gas activities. We are investigating the use of tags that record oceanographic information to identify ocean features, such as fronts where whales prefer to feed. We are developing an acoustic tag that will record ambient sound and the vocal behavior of the whales to better understand the effects of high noise level activities such as seismic surveys and drilling activity. This project began in 2006 and is a collaboration among the Alaska Department of Fish and Game, the Alaska Eskimo Whaling Commission, Whaling Captain’s Associations of Barrow, Kaktovik, Gambell, and Savoonga, the Aklavik and Tuktoyaktuk Hunters and Trappers Committees, the North Slope Borough, the Barrow Arctic Science Consortium, the Department of Fisheries and Oceans Canada and the Greenland Institute of Natural Resources. The project is funded by the Bureau of Ocean Energy Management. Quakenbush, L. T., R. J. Small, and J. J. Citta. 2013. Satellite tracking of bowhead whales: movements and analysis from 2006 to 2012. (PDF 3,635 kB) U.S. Dept. of the Interior, Bureau of Ocean Energy Management, Alaska Outer Continental Shelf Region, Anchorage, AK. OCS Study BOEM 2013-01110. 56 pp. Quakenbush L., J. J. Citta, J. C. George et al. 2012. Seasonal movements of the Bering-Chukchi-Beaufort stock of bowhead whales: 2006-2011 satellite telemetry results. (PDF 6,706 kB) International Whaling Commission Science Committee Report SC/64/BRG1. Quakenbush, L., R. Small, and J. Citta. 2010. Satellite tracking of western Arctic bowhead whales. Final report. (PDF 3,490 kB) OCS Study BOEMRE 2010-033. Drukenmiller, M.L., J.J. Citta, M.C. Ferguson, J.T. Clarke, J.C. George, and L.T. Quakenbush. In review. Trends in sea ice cover within bowhead whale use areas in the Pacific Arctic. Deep Sea Research II. Citta, J.J., S.R. Okkonen, L.T. Quakenbush, W. Maslowski, R. Osinski, J.C. George, R.J. Small, H. Brower, and M.P. Heide-Jørgensen. In press. Oceanographic characteristics associated with bowhead whale movements in the Chukchi Sea in autumn. Deep Sea Research II. Christman, C. L., Citta, J. J., Quakenbush, L.T., Clarke, J. T., Rone, B. K., Shea, R. A., Ferguson, M. C., and M. P. Heide-Jørgensen. 2013. Presence and behavior of bowhead whales (Balaena mysticetus) in the Alaskan Beaufort Sea in July 2011. Polar Biology doi: 10.1007/s00300-013-1395-4. Citta, J. J., L. T. Quakenbush, J. C. George, R. J. Small, M. P. Heide-Jørgensen, H. Brower, B. Adams, and L. Brower. 2012. Winter movements of bowhead whales (Balaena mysticetus) in the Bering Sea. Arctic 65(1):13-34. Heide-Jørgensen, M. P., K. L. Laidre, L. T. Quakenbush, and J. J. Citta. 2011. The northwest passage opens for bowhead whales. Biology Letters doi: 10.1098/rsbl.2011.0731. Quakenbush, L. T., J. J. Citta, J. C. George, R. J. Small, and M. P. Heide-Jørgensen. 2010. Fall and winter movements of bowhead whales (Balaena mysticetus) in the Chukchi Sea and within a potential petroleum development area. Arctic 63:289-307.